This will be the fourth week in a row where I’ve gone with a one word title for my weekly commentary (and by “commentary” I really mean “disjointed ramblings”). The theme for the last few weeks, starting with JDH Predicts a Short Term Top (So Probably Time to Buy) from four weeks ago, and continuing with Compression, Questions, and Sardines, is quite simple: I believe we are near a top in the market, so it’s time to head for the hills. Strange, eh? After all of the volatility of the past three years, we are now in a period of very eerie calm. It’s as though we are in 1950, an everything is great, and the market will just slowly increase, forever. We are in a period of complacency. There are no problems, everything is good, if one assumes that the “market” and the “real world” are the same thing. I don’t believe that everything is great, and I don’t believe we should be complacent, and apparently I’m not the only one. David Rosenberg, Chief Economist at Gluskin Sheff, has identified Six “Pins” that can pop the Complacency Bubble. What could shake us out of our complacency? 1 Job market improvement is really just deteriorating productivity growth. You can only slash and burn jobs for so long before you have to hire a few people, and that’s where we are no. 2 The housing recovery in January was really just due to a warm winter, which allowed building to start early. 4 Oil prices are on the rise. 5 Tax rates in the U.S. are going up, big time. 6 Financial contagion is spreading. All it will take is a CDS or other default that spreads through Europe and the rest of the world, and down we go. No-one really believes the Greek problem is all fixed; we are still in the early stages of a potential contagion. I agree. I agree that there are lots of risks, so complacency is not warranted. The fact that the government is printing money that is being deployed in an orderly manner to gently inflate the stock market does not mean that everything is perfect. Of course gold investors realize this, which is why the price of gold has risen steadily for the last decade. 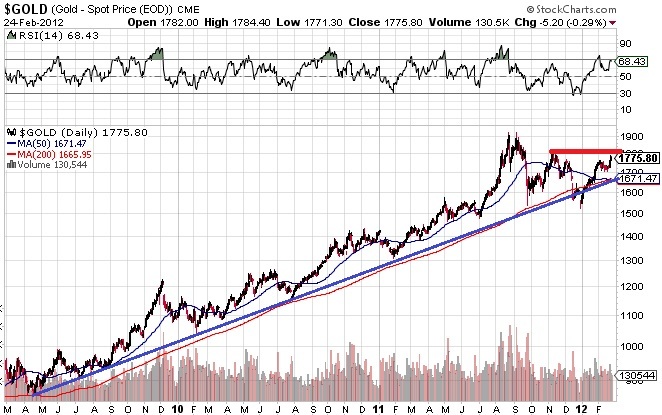 However, while the rise is gold is both steady and largely uninterrupted, it is quite possible that the red horizontal line on the gold chart is a resistance level that may take some time to break through. The Relative Strength Index at 68 is high; it can certainly go higher, but if you want to make serious money trading gold, or anything, it’s better to buy when the RSI is 30, or for you more conservative types, when it’s first crossing over the 50 level. My point: long term, gold is going to $5,000, or $50,000, or whatever. 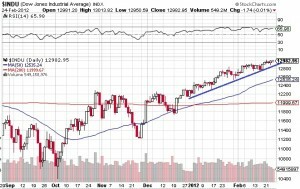 Short term, over the next month or two, we could be in for a down draft, both in the markets and in gold. So, call me a wimp if you want, but over the last two weeks I have gradually sold small portions of my portfolio. I now sit at 53% cash, my highest cash level in quite some time. 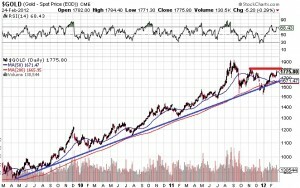 The remainder of the portfolio is largely in precious metals stocks, both majors and juniors. Both gold and the markets have had a good run in the first two months of this year. Nothing lasts forever; a pullback is inevitable. If it happens, I want to have lots of free cash on hand. Of course I could be wrong; the market, and gold, may continue to increase forever. If so, no problem, my stocks will increase, I’ll add to my profits on the year (I’m up around 12% year to date), and I’ll sleep well at night. I suspect this will be an uneventful week, but once we get in to March, who knows. Check back next week and we’ll see how it went. Thanks for reading, and have a good week.